Bill Ward and William France Sr.
Talladega Superspeedway, formerly named Alabama International Motor Speedway (AIMS), is a motorsports complex located north of Talladega, Alabama. It is located on the former Anniston Air Force Base in the small city of Lincoln. A tri-oval, the track was constructed in 1969 by the International Speedway Corporation, a business controlled by the France Family. 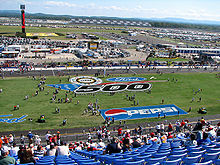 The track currently hosts the Monster Energy NASCAR Cup Series, NASCAR Xfinity Series, and NASCAR Gander Outdoors Truck Series. Talladega is the longest NASCAR oval with a length of 2.66-mile-long (4.281 km) like the Daytona International Speedway, which is 2.5-mile-long (4.0 km). The peak capacity of Talladega is at around 175,000 spectators, with the main grandstand capacity currently being at about 80,000. During the 1960s, William "Bill" France, Sr. wanted to build a track faster and longer than Daytona International Speedway. After failed attempts to reason with local government in Orange County, North Carolina with the Occoneechee Speedway, he attempted to find a new spot for a race track and make his idea a reality. After failing to secure a location near the research triangle around Raleigh, France then looked around between Atlanta and Birmingham along Interstate 20. He would end up breaking ground on an old airfield on May 23, 1968. The track opened on September 13, 1969 at a cost of $4 million. The track was named the "Alabama International Motor Speedway". The name would remain for twenty years until 1989 when the facility's name was changed to "Talladega Superspeedway". In the first race at the track, all the original drivers abandoned the track due to tire problems, which allowed France to hire substitute drivers with the winner being Richard Brickhouse. After the first race, Talladega hosted two Cup Series races a year, one of which would become part of the 10-race NASCAR Cup Series playoff format. Since its opening year, Talladega has hosted many races and has been repaved four times. Talladega also has had many first-time winners, such as Richard Brickhouse, Ron Bouchard, Bobby Hillin, Davey Allison, Brian Vickers, Brad Keselowski, and, in 2017, Ricky Stenhouse Jr.
A 4-mile (6.4 km) infield road course was in operation from the track's founding until 1983. In the 1970s, six IMSA GT Championship races were held at the speedway, including a 6-hour race in 1978. The International Motorsports Hall of Fame museum was opened in 1983. In May 2006, Talladega started to re-surface the track and the apron. Construction started on May 1 and lasted until September 18. The first race on the resurfaced race track was a NASCAR Craftsman Truck Series race on October 7. In December 2013, the ISC announced removal of the 18,000-seat Allison Grandstand on the backstretch, reducing the track's seating capacity to 80,000. The 4,000-ft backstraightaway was renamed the "Alabama Gang Superstretch" in time for the 2014 Aaron's 499 held in the spring. Speeds in excess of 200 mph (320 km/h) are commonplace at Talladega. Talladega has the record for the fastest recorded time by a NASCAR vehicle on a closed oval course, with the record of 216.309 mph (348.116 km/h) set by Rusty Wallace on June 9, 2004. Wallace circled the 2.66-mile (4.28-km) trioval in 44.270 seconds, which surpassed the previous record held by Bill Elliott (212.809 mph (342.483 km/h)) set in 1987, but did not replace the record because it was a radio test and not a NASCAR sanctioned event. Buddy Baker was the first driver to run at a speed over 200 mph (320 km/h), with a 200.447 mph (322.588 km/h) lap during "testing" on March 24, 1970. Bill France himself invited Chrysler to come on down to run a 200 lap for publicity for the April race. The car was fully NASCAR inspected and certified. NASCAR sanctioned the event and Bill Gazaway was there with the official timing equipment. Baker's 200 mph lap was set while driving the No. 88 Chrysler Engineering Charger Daytona. It is currently undergoing restoration in Detroit, after being found in the late 1990s in Iowa. Benny Parsons was the first driver to qualify at over 200 mph (320 km/h), doing so in 1982 with a speed of 200.176 mph (322.152 km/h). In May 1987, Bobby Allison, after contacting debris from a blown engine, cut his right-rear tire while going through the tri-oval portion of the track. The car was vaulted airborne. His car damaged a portion of the frontstretch catch fence, but did not enter the spectator area. NASCAR imposed rule changes to slow the cars after the incident, with a 1988 rule requiring cars running there and at Daytona to again use restrictor plates. The most often cited reason is a fear that the increasing speeds were exceeding the capabilities of the tires available at the time, as high-speed tire failure had led to some terrific crashes at slightly lower speeds. The plates limit the amount of air and fuel entering the intake manifolds of the engine, greatly reducing the power of the cars and hence their speed. This has led to an extremely competitive style of racing at Talladega and Daytona. Allison's crash was very similar to Carl Edwards's airborne crash at the 2009 Aaron's 499. The reduced power affects not only the maximum speed reached by the cars but the time it takes them to achieve their full speed as well, which can be nearly one full circuit of the track. The racing currently seen at Talladega is extremely tight; often in rows of three or four cars, and sometimes even five lanes wide on the straightaways throughout most of the field, as the track is wide enough to permit such racing. Breaking away from the pack is very difficult as well. Such close quarters, however, makes it extremely difficult for a driver to avoid an incident as it is unfolding in front of them, and the slightest mistake can lead to a multi-car accident – dubbed "the Big One" by fans and drivers. It is uncommon, but possible, to see 20 or more cars collected in the crashes. Occasionally, cars go airborne and barrel-roll or slide on their roofs, although NASCAR has made several advances in safety over the years to lessen the chance of a car going airborne. Numerous strange occurrences at the track have led to rumors of Talladega being cursed. Stories of the origin of the curse vary. Some claim that a local Native American tribe held horse races in the valley where the track currently resides where a chief was killed when he was thrown from his horse. Others say that the site of the superspeedway was once an Indian burial ground. Still another version says that after the local tribe was driven out by the Creek nation for their collaborating with the forces of Andrew Jackson, a shaman put a curse on the valley. Since the construction of the track, many unusual events and untimely deaths have fueled the rumors of a jinx or curse. In the 1973 Talladega 500, NASCAR Rookie of the Year Larry Smith died of massive head injuries in a solo crash, one that was reported by commentators as a heavy hit, but believed by no means bad enough to be fatal. Later in the same race, driver Bobby Isaac parked his car and announced he was quitting racing; he did not participate in another 1973 race. Isaac explained, "Something told me to quit. I don't know anything else to do but abide by it." At the time of Isaac's death in 1977, friend and colleague Ned Jarrett told reporters that the reason Isaac parked his car in Talladega was because he "had heard a voice that told him to quit". During the 1974 Winston 500, Penske Racing crewman Don Miller lost part of his leg in a pit lane accident. Miller was helping service his team's AMC Matador, driven by Gary Bettenhausen. The car was hit by another driver in pit lane, pinning Miller between the pit wall and Bettenhausen's car. In the Talladega 500 a few months later, ten of the top eleven qualifying drivers found that their cars had been mechanically - and elaborately - sabotaged the night before the race. While the majority of the damage was quietly repaired before the race, the culprit was never found. In the 1975 Winston 500, Randy Owens, brother-in-law of Richard Petty and a crew member on the family team Petty Enterprises (father of current NASCAR Cup Series crew chief Trent Owens), was killed by an air tank that exploded in the pits. To some, Bobby Allison's wreck in 1987 described above was yet another reminder of the curse. In 1993, his son, Davey Allison, died in a helicopter crash in the infield of Talladega. In 1996, Automobile Racing Club of America president Bob Loga died after a traffic accident in a parking lot. The Legend of Hallowdega, a comedic short film about the Talladega jinx, was directed by Terry Gilliam and released in 2010. Talladega hosts many NASCAR events which include two Monster Energy NASCAR Cup Series races, one Xfinity Series race, and one Truck Series race. The Cup Series races include the GEICO 500 and the 1000Bulbs.com 500, which are both 188 laps each or 500.08 miles (804.80 km). The Xfinity Series race has historically been a 311.2-mile/500-kilometer (117 laps) since its 1992 inception, but was cut to 300 miles (480 km) (113 laps) in 1998 due to a spectator's letter questioning the metric distance, but restored to 500 kilometers by its current sponsor. The Truck Series race is 250 miles (94 laps). The ARCA race, once a 500 kilometer affair, was shortened to 300 miles in 1998 and to 250 miles in 2006 when it was moved to Friday. Most consecutive Wins 4 Dale Earnhardt, Jr. The circuit's infield also hosts the Birmingham Ultimate Disc Association Mud Bowl tournament in the winter. March 24, 1970: Buddy Baker, driving the Chrysler Engineering No. 88 Dodge Charger Daytona, officially became the first driver in NASCAR history to break the 200 mph (320 km/h) barrier by turning a lap of 200.447 mph (322.588 km/h). This was also a world record at the time for any vehicle on a closed course. It was achieved using official NASCAR scoring and timing equipment. August 20, 1971: Paula Murphy, "Miss STP" made a record closed course run for a female at 171.449 mph (275.920 km/h). August 3, 1974: A. J. Foyt set a closed-course exhibition record in an Indy car with a lap of 217.854 mph (350.602 km/h). August 9, 1975: Mark Donohue set a closed-course world record in a Porsche 917-30 at 221.160 mph (355.923 km/h). It stood as a world record for four years, and as a United States record until 1986. May 6, 1984: The Winston 500 set a motorsports record with 75 lead changes in a single race. May 5, 1985: Bill Elliott set a 500-mile race record, winning the Winston 500 at an average speed of 186.288 mph (299.801 km/h). Elliott won the race despite losing nearly two laps during a lengthy early pit stop to fix a broken oil line, and despite the race only having two caution flags. Elliott made up the entire distance he lost under one lengthy, green-flag period. The record stood as the fastest 500-mile race of any kind until 1990, when Al Unser, Jr. broke it by winning the CART Michigan 500 at Michigan International Speedway at an average speed of 189.727 mph (305.336 km/h). Mark Martin later broke the record for fastest 500-mile NASCAR race (see below). November 26, 1985: Lyn St. James set a record closed course run for a female, at over 200 mph (320 km/h). March 24, 1986: Bobby Unser set a closed-course speed record for four-wheel drive vehicles with an Audi 5000CS Turbo Quattro at 206.825 mph (332.853 km/h) with a top speed over 350 km/h (220 mph). The car was compliant with NASCAR rules. 1986: The Saab Long Run – set 2 world and 21 international records with three series SAAB 9000 Turbos – 100,000 km (62,000 miles) with an average speed of 213.299 km/h (132.538 mph) and 50,000 miles (80,000 km) with an average speed of 213.686 km/h (132.778 mph). April 30, 1987: Bill Elliott set the all-time NASCAR qualifying record, winning the pole for the Winston 500 at a speed of 212.809 mph (342.483 km/h)(44.998 seconds). The record still stands due to the use of the carburetor restrictor plates, mandated after the 1987 season. October 11, 1988: Lyn St. James set a record closed course run for a female at 212.577 mph (342.110 km/h), driving a Ford Thunderbird. December 14, 1989: Patty Moise set a record closed course run for a female at 216.607 mph (348.595 km/h), driving a Buick. January 23, 1990: Patty Moise set a record closed course run for a female at 217.498 mph (350.029 km/h), driving a Buick. 1996: Saab set endurance and speed record-breaking runs in their 900 Talladega. May 10, 1997: Mark Martin won the Winston Select 500, a race which had no caution flags, at a NASCAR 500-mile record speed of 188.354 mph (303.126 km/h), nearly ten years after the introduction of restrictor plates. October 15, 2000: Dale Earnhardt set a record for the most wins at the track with 10. This was also his 76th and final win before his death in the 2001 Daytona 500. April 6, 2003: Dale Earnhardt, Jr. won his fourth consecutive Cup race at Talladega. The race also saw NASCAR's largest NASCAR Cup Series wreck to date, when 27 cars piled up in turn one on lap four. June 10, 2004: Rusty Wallace, while testing a stock car without a restrictor plate for series sponsor Nextel to test communication capabilities, got an overall lap time of 44.27 seconds at 216.309 mph (348.116 km/h), beating Elliott's old record by more than seven-tenths of a second. Wallace topped out at 228 mph in testing and said that speeds of about 235 mph were attainable. April 25, 2010: The Aaron's 499 broke the 1984 mark of 75 lead changes with 88; it also set a new motorsports record with 29 different leaders. October 7, 2012: A crash involving 25 cars erupted on the final lap when Tony Stewart and Matt Kenseth were battling for the win; Stewart made contact Michael Waltrip and went up the track in turn four; he flipped over as the field plowed into a suddenly blocked track. Jeff Gordon and Kyle Busch escaped the crash as Kenseth went on to win. The race lead changed a season-high 54 times. A large number of drivers won the first race of their careers at Talladega. As of May 6, 2017, 11 drivers have won their first race at Talladega. * As of 2018, this was their only career win in the series. 2007: Postcards from Buster This Just In! ^ a b "Track Location". Talladega Superspeedway. Archived from the original on April 16, 2010. Retrieved March 27, 2010. ^ "Talladega Superspeedway Track News, Records & Links". jayski.com. Retrieved March 5, 2016. ^ "Track Facts". Talladega Superspeedway. Archived from the original on April 16, 2010. Retrieved March 27, 2010. ^ Utter, Jim (November 27, 2013). "Talladega Superspeedway to reduce seating to 80,000". The Charlotte Observer. The McClatchy Company. Archived from the original on December 3, 2013. Retrieved November 28, 2013. ^ "History". Talladega Superspeedway. Archived from the original on April 16, 2010. Retrieved March 28, 2010. ^ Talladega Superspeedway. na-motorsports.com. April 24, 2006. ISBN 0-7368-4379-5. Retrieved November 29, 2009. ^ "Talladega – List of Races". Racing Sports Cars. Retrieved November 29, 2009. ^ "2006 Reconfiguration". USA Today. Retrieved March 28, 2010. ^ "Allison Grandstand being removed as part of Talladega Superspeedway renovation". AL.com. Retrieved April 26, 2015. ^ Estrada, Chris (May 4, 2014). "Talladega renames backstretch after NASCAR's famed "Alabama Gang"". motorsports.nbcsports.com. NBC Sports. Retrieved April 26, 2015. ^ a b "Rusty Wallace hits 228 mph in Talladega trial". NASCAR.com. Talladega, Alabama: NASCAR Media Group, LLC. March 27, 2016. Archived from the original on June 12, 2004. Retrieved March 27, 2016. ^ a b c Hinton, Ed (April 23, 2009). "They're hearing voices at Talladega". ESPN.com. ESPN Internet Ventures. Retrieved April 23, 2009. ^ "Media Center - MRN.com". www.mrn.com. Archived from the original on March 31, 2016. Retrieved March 23, 2016. ^ "Historical Motorsports Stories: NASCAR's Urban Legends: Larry Smith & Bobby Isaac - Racing-Reference.info". racing-reference.info. Retrieved March 23, 2016. ^ "Bobby Isaac dead at 43". Spartanburg Herald-Journal. Hickory, North Carolina: GateHouse Media. Associated Press. August 15, 1977. Retrieved March 27, 2016. ^ "Historical Motorsports Stories: The Race Cars Have Been Sabotaged! - Racing-Reference.info". racing-reference.info. Retrieved March 23, 2016. ^ info@motorsportmemorial.org, The Motorsport Memorial Team,. "Motorsport Memorial -". www.motorsportmemorial.org. ^ "Bob Loga fatally injured". motorsport.com. April 27, 1996. Retrieved November 3, 2013. ^ "Foyt Runs 217.854 MPH In Coyote For World Mark". The Indianapolis Star. August 4, 1974. p. 57. Retrieved July 21, 2016 – via Newspapers.com. ^ Pockrass, Bob (October 7, 2012). "NASCAR Talladega results: Matt Kenseth wins; massive crash on final lap". SportingNews.com. Talladega, Alabama: Sporting News. Archived from the original on October 9, 2012. Retrieved October 7, 2012. Bolton, Mike and Jim Nunn (October 7, 2006) "Talladega doesn't measure up." Birmingham News. – Updates previously published track dimensions with new measurements taken during 2006 repaving. Fielden, Greg. NASCAR Chronicle. Lincolnwood, IL: Publications International, Ltd., 2004. Wikimedia Commons has media related to Talladega Superspeedway. GNEXTINC.com: Talladega Superspeedway Page – Local area information, track specs, mapping, news and more.